This time of year, the only warm place to nap in the sun is on the dining room table. It isn’t optimal, but barn cats like Hank have to make do. ← Rescue: Not for the Faint of Heart. beautiful barn cat! beautiful flowers! 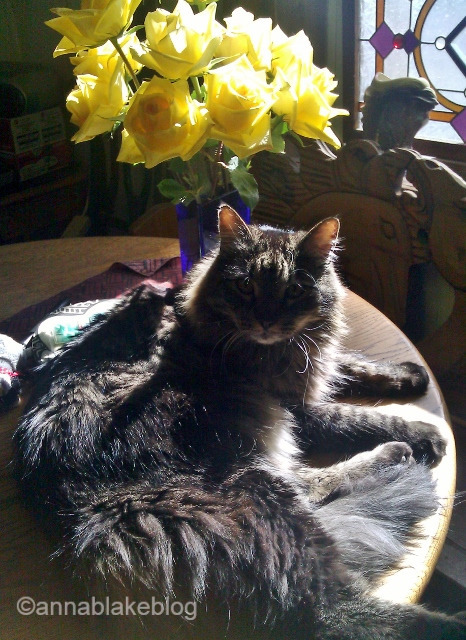 Am getting an outdoor heating pad for my elderly old lady barn cat…she doesn’t have a dining room table! Merry Christmas! Very nice. Kudos on mastering the use of your cellphone’s camera. I have a horrible time trying to use mine. I have better luck with the real thing. My phone does more bad than good, but I have it with me. That is the ONLY advantage of it. And I have a farm full of posers. That helps too. Thanks for commenting. And Happy New Year back! Thanks.